There comes a time in every business owner’s work experience, that they must let an employee go. However, firing an employee can have its own set of legal, personal, and professional worries. In order to assure that the process goes as smooth as can be expected, there are 10 tips for letting an employee go in the right way. 1. If the employee has been with the company for several years, he/she should at least deserve to have a warning or probationary period. Sometimes this type of warning will prompt the employee to change his/her work habits and performances for the better. However, sometimes the employee still won’t change. 2. Leave a trail of paperwork. Be sure to document every task and response from the employee if he/she is on a probationary or warning period. If you have every single interaction recorded down, it will be easier to justify the dismissal, especially in the unfortunate event of a case being brought to court. 3. Choose when to fire the employee wisely. Do not plan on firing someone the Friday before a weekend or holiday. Plan on notifying the employee of the dismissal early in the week and in the morning. 4. 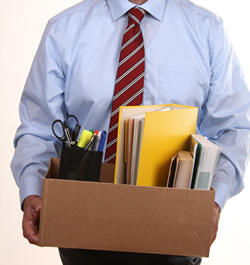 Be sure to have all the necessary paperwork prepared to hand to the terminated employee. Often the law requires that you present information on any unused vacation or benefits. 5. It is best to have someone from the human resources department assist you in the termination meeting. It will provide a witness on your side as to what was said and also they can assist in answering any final questions the employee may have. 6. Reassure the employee that this termination meeting is held in the utmost confidentiality. Only you and the human resources representative will be present and aware of the interaction. 7. Be to the point and brief with the employee. Do not drag the termination meeting out, which may make the employee feel as though the termination isn’t a final decision. 8. Choose your words and tone of voice very carefully. It important to stand firm in your decision, but to show sympathy towards the employees situation. Do not compare or elaborate on your own experiences. Rather, be honest and firm. 9. It is realistic to assume the terminated employee will have feedback. Allow the employee a few moments to voice his feelings. If he doesn’t respond in 30 seconds, move on. You don’t want to gain a bad reputation for this termination. However, it is important to remember that this is a termination meeting, not a dialogue interaction. 10. Offer words of encouragement and best wishes to the employee’s future professional opportunities. Shake hands and remember to thank the employee for the years that he did work for you. Do not be surprised when the employee doesn’t return the thanks. If you run a transportation business, visit our website at thetenneygroup.com for more tips & strategies for being successful with your company, staff and customers. We offer a myriad of services including general consulting for transportation related businesses as well as selling/buying assistance, business valuation and more.